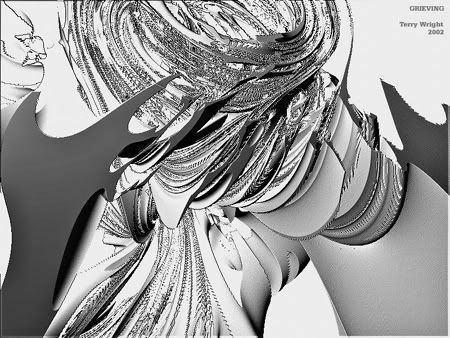 I go on a quaternion fractal kick for a few weeks almost every year. There’s something very special about these sculpted, rolled in Play-Doh, Tootsie Roll forms. I find them fascinating because they seem more tactile and three-dimensional than most other kinds of fractals. They can also be more visually evocative. Maybe that’s because they occasionally break the restraints of abstraction. Moreover, they sometimes share important traits with literary works: tone and mood. 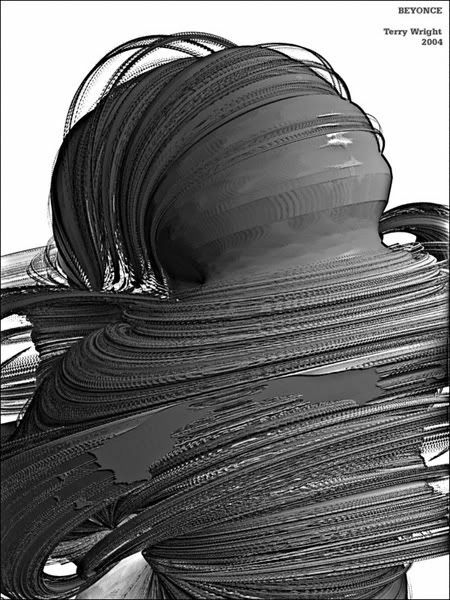 Because fractals are generally so highly abstract, generating a mood along with an image can be an added plus. And while it’s true that other kinds of fractals, like L-System forms, can produce life-imitating shapes like ferns and branches, quaternions sometimes bear a resemblance to more complex living things. But these imitations, perhaps because of the 3-D nature of the forms, are far from flat planes or “stick figures.” Rather, they can contain a powerful, emotionally-charged resonance. I guess it’s the semi-anthropomorphic, I-recognize-that features of quaternions that fascinate me. Maybe the image above doesn’t suggest the pop diva of Dreamgirls to you — but I see her languid body and graceful movements on display. Over the years, I’ve seen so many curious things cooking away on my computer: ravens, dictators, male models, meter maids. So, don’t let anyone tell you — as a painter recently said to me — that “fractals don’t look like anything.” Quat nonsense. All images were made in QuaSZ and mildly post-processed in Photoshop and other graphics programs. 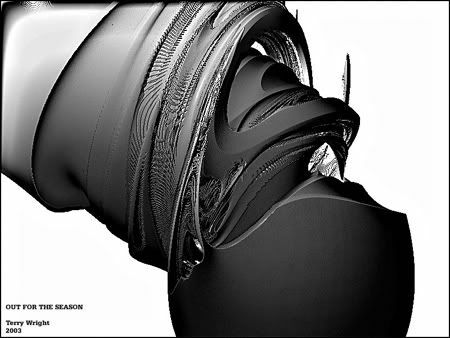 This paradoxically and intriguing surfaces make me go wow!They are like creactions of an eccentric architect demonstrating that science and art come from the same creative spirit, despite acting in different ways upon the reality. 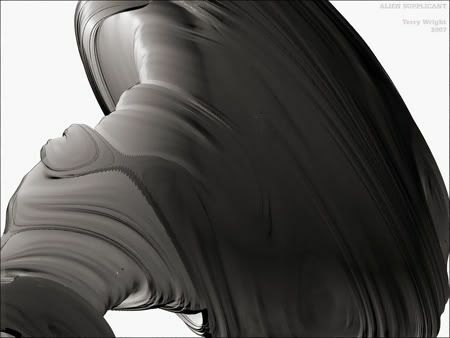 These weird surfaces are very different but it can be quite dificult to descibe whats different about the mmulti-dimensional manipulations of them. Yep, most times fractals don’t really look like anything. But – and here’s the neat thing – many times the “feel” or “suggest” something to those blessed with the open, creative and imaginative minds to “hear” what they are saying or “feel” the vibe they convey.